Your party needs you. In the face of a fascist USA, impending nuclear conflagration and rampant global warming, New York’s Kegmaster General Andrew WK returns from an eight-year disco nap to remind us that in times of great hardship we must come together for the sake of future generations and party harder than ever before. 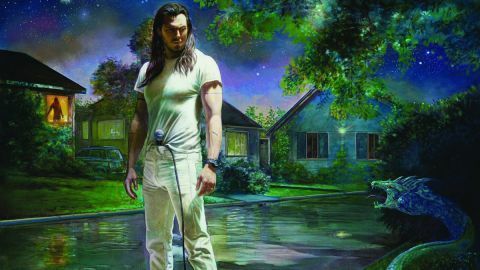 You’re Not Alone is Andrew WK’s enormous, and enormously stirring, maximal synth-metal soundtrack to the struggle, and were it any bigger it’d develop its own moon. Orchestral crescendo crashes upon power riff upon gargantuan chant chorus upon show-stopping fanfare; it’s like listening to the Polyphonic Spree getting blitzed on super-strength Kool Aid to old Mötley Crüe records. The Party Never Dies could be primeera ELO crashing their spaceship into the world’s biggest frat house, Party Mindset imagines the Beach Boys going glam metal, while I Don’t Know Anything and Music Is Worth Living For are essentially Meat Loaf exploding. If 80s rock music could ever be weaponised, then voila. Thematically, if previous Andrew WK albums have felt like having entire kegs shotgunned in your face, this one is like being syphon-fed after-dinner brandies. Dotted with spoken-word speeches, sermons and psychological TED talks about how we must “party with our demons” and “keep clarity just out of reach”, it explores how ‘party’, as philosophy, lifestyle and self-help technique, will save humanity. Our round.